In May 2017, I found myself floating in the midst of a lot of jellyfish. Not quite enough to qualify as a swarm, but enough to make it wise for me to weave in and out of the stingers. They came in waves. Most were relatively harmless moon jellies, but every once in a while, something interesting floated past. One cnidarian in particular caught my eye. It was colourful, adorned with speckles of fluorescent pink and lime-green, quite pretty in fact. Like most jellies, this one was at the mercy of the current. As it was pushed along, swirls and eddies in the water caused it to twist and turn, fold over upon itself, contort into un-photogenic postures. This picture-perfect pose happened only once during the 30 or so minutes I swam along. I took the photo above, admired the pretty colours, read up a little bit about the species (Olinidias formosus, common name = flower hat jellyfish, ハナグサクラゲ), but otherwise didn't give it much thought. Biographic.com recently featured this photo, along with some fascinating background information. 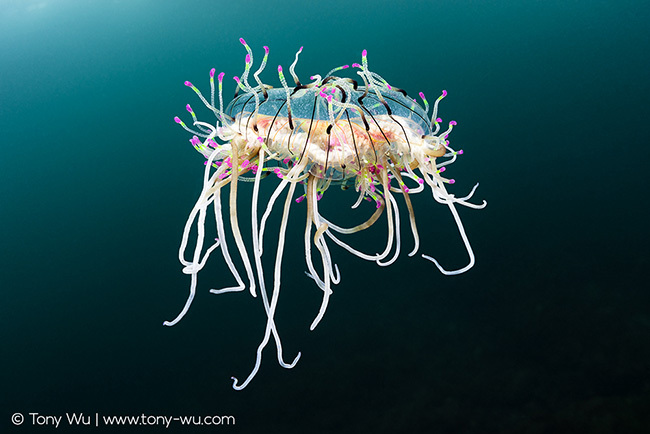 As it turns out, researchers published a paper* in 2015 describing how this jellyfish uses fluorescence to attract prey. Those pretty colours aren't just for show! If you're interested in reading more, click over to the Biographic write-up, or if you're super-keen, you can read the paper online here, or download a PDF from this link.